We have a busy couple of days ahead of us, so I’ve already packed our bags in anticipation of Sunday’s early morning flight to Perth. David will take us to the airport, but I will be flying alone with the three girls. Aisha and Brioni will have their own seats, and Calista will be on my lap. Every time I visit Perth, I fly with one more child than I had on the previous trip, and this will be the first time that I’ve flown with three kids. I've prepared this little package (one for each older girl) as a present for David to give them when we're waiting to board our flight. 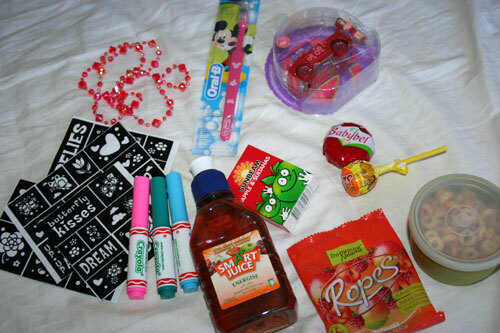 The little presents, food and lollipop(!) should keep them amused on the five-hour flight. I also have a couple sticker books and one picture book to look at when their attention wavers. To combat airport boredom, we’ve invested in two trunkis. These ride-on toys/carry-ons fit the dimension requirements for hand luggage, and I’ve packed the girls’ clothes into them. Aisha and Brioni have loved trying them out, although I have been trying to keep them in storage so they’ll still be novel when we’re at the airport. 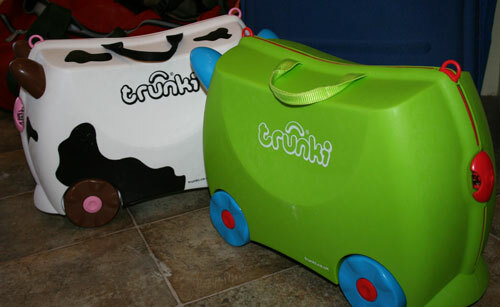 The idea of the trunki is that a child can sit, ride or be pulled on their own hand luggage. The clasps on the side can be locked with a simple plastic key, keeping the contents intact from inquisitive hands. David wasn’t impressed with the size, so the jury is still out on whether they’re an asset or just more fantastic plastic. Brioni has the cow trunki, and Aisha's is green. As I'll be carrying Calista around the airport, these should mean that the girls can make their own way as we trek to and from departure/arrival gates. When we’re going to be in public as a family and possibly drawing attention to ourselves by our noise level, I like to dress the girls very “cutely” so we may gain sympathy for beauty when we would otherwise offend. I also like to dress us all in the same colour. I tell myself it’ll be easy to keep track of everyone, but really, I think it’s part of my obsession with matching items. Aisha has become interested in dancing, so I sewed a tutu skirt onto the bottom of a red t-shirt and paired it with a cute pair of red shoes that I bought recently for just $2 for an op shop. I just wanted to tell you that I love your bog. It has been so fun to read. Wow! You are so organized!! Make sure you let us know if those “trunkis” worked. I may need to invest in some. :) Have a great trip. 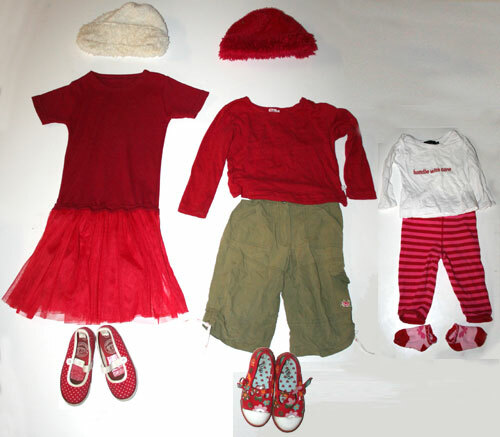 Why not carefully plan the girls’ outfits in advance? You have so many beautiful clothes to choose from! (I especially love the shoes!) I think the presents from ‘David’ will be very well received. Have a wonderful time in Perth – stay up late, read lots of books, enjoy guilt free op-shopping and be thankful to spend so long with your beautiful sister.